To open, the choir sang a piece by the grandfather of American music Charles Ives (1874 - 1954). His Sixty-Seventh Psalm was written in 1894 when the composer was just 20. In it Ives pushes conventional hymnody to the limit by setting the piece bitonally. The result is in one sense astounding, the harmonic sounds are far in advance of their time. But, unlike other experimenters with tonality, Ives only succeeds in creating a series of dully opaque chords. That said, the choir's performance was confident and brilliant in its way. Londinium is a London-based voluntary chamber choir which specialises in singing unusual repertoire, mainly unaccompanied, and assembling interestingly quirky programmes. The numbers fielded in the concert, 39 singers arranged as 12 sopranos, 9 altos, 9 tenors and 9 basses, seemed slightly on the high side for the repertoire but you hardly noticed, such was the capability and dexterity of the singers. Benjamin Britten (1913 - 1976) wrote the Hymn to St. Cecilia in 1942 on the boat home to Europe, though Auden had supplied him with the text earlier and there is a sense that the piece is a last hurrah to his close artistic relationship with Auden. The words are dazzling and confusing, Auden hides his meanings beneath a surface glitter and this challenged Britten to write some of his most brilliant music. After a hint of uncertainty at the opening, the first movement settled down into an elegant, if gentle, dance. I found Griffiths's tempo a little too sedate and the women's vocal line came over as rather too smooth with not enough dancing bounce. 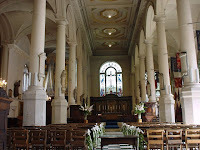 It was here that the issue of the venue came to the fore as, despite the hard work of the singers, the words rather evaporated up into St Sepulchre's capacious volume. The Hymn to St Cecilia is about the sparkling combination of words and music, both should be crisply apparent. That said, the choir made a good firm sound and were technically confident and responded to Britten's surface brilliance. The second movement tempo was just right, creating a dashing scurrying feeling with the rhythms nicely pointed, though again the words were too soft edged. There were moments, here and elsewhere, where the basses seemed a little underpowered as if Griffiths chosen balance of voices in the choir was working against them. The final movement was well sung, with some confident solos from the choir including a neat soprano solo in O dear white children. But it seemed a little too comfortably sedate, though I am uncertain whether this was a fault of the performance or the acoustic. I apologise if I seem to be harping on about this, but I did feel that the rather damp acoustics in St. Sepulchre robbed the performance of much of the verbal dazzle and crispness that it needed. Aaron Copland's (1900 - 1990) In the Beginning isn't a piece which needs to dazzle, but the work is still very much about text as the composer set the first chapter of the Book of Genesis. The work was written in 1947, a few years after Britten left America, but the two composers were friends and In the Beginning is Copland's most important choral work. Written for solo mezzo-soprano (Carris Jones) and chorus, the composer's intention was to be as accessible and as direct as possible. Opportunities for display are eschewed, so that there is no explosion on Let there be light, instead Copland presents the text in as illuminating a manner as possible. The work opens with the soloist alone, here Carris Jones displayed good firm tone and an admirable ability to get the words over. Initially the chorus alternates with the soloist, only gradually does Copland developed the texture and mix the two. Always there is the feeling that music is simple, but it is a simplicity which hides complex depths and it is a simplicity which allows little room for error on the part of the choristers. Londinium's performance was nicely firm and accurate, and the managed to bring to it the feeling that they sang this every day, it had an admirable naturalness. Words were audible, but as with many oratorio performances, I felt that they just did not make enough of them; again this is a piece about text. Though of course, the acoustic may have played its part here as well. The piece isn't all plainness, in day four Copland introduces some delightfully jazzy rhythms, which soloist and choir responded. Then at the end, with God forming man and breathing life into him, the singers rose to a brilliantly ecstatic climax. The second half opened with a setting of Gerard Manley Hopkins by Samuel Barber (1910 - 1981). Barber's setting of God's Grandeur was written in 1938 just a year before Britten's setting, but the two composers never met and both settings remained unpublished during the composers' lifetimes. Barber's setting is a brilliant one, for double chorus. It starts with a big boned, homophonic utterance in which Ives's hymnody does not seem far away. But then Barber seems determined to impress with his double chorus writing. The work isn't as easy and relaxed as some of his other pieces, and the rather over fussy choral writing did not always come over well. The singers were clearly working hard, but I had the guilty thought that perhaps not quite enough rehearsal time had been devoted to the piece. Randall Thompson's Alleluia dates from 1940 and was written for the inauguration of the Berkshire Music Center at Tanglewood. It is still performed there regularly and received a confident, perfectly placed account by Londinium. The concert closed with Britten's A.M.D.G. which was written in 1939. Though some movements were performed in America, Britten withdrew the work and it wasn't performed complete until 1984. The poet's intense Roman Catholic visionary verse seems a slightly odd choice for Britten. This is especially so when in movements like God's Grandeur, his brilliant setting seems to work against the words; something which is particularly true of the final movement The Soldier where the music evokes Britten's cabaret mood despite the seriousness of the poet's meaning. Perhaps Britten was interested in the way that Hopkins struggled and repressed his homosexual desires; many critics feel that the imagery in Hopkins poetry was the poets way of suppressing and channelling his homosexual feelings. But, frankly, none of this seems to come out in Britten's settings. A.M.D.G. is, however, a terrific piece if taken on its own terms and one which gives the choir a chance to shine, which Londinium did quite brilliantly. Their performance of the whole work was a tour de force, and it was presented with a confidence, firmness and vividness which was altogether admirable. The intense first movement, Prayer I, with some nicely placed spicy harmonies, constantly racked up the tensions. Then in the second Rosa Mystica Britten allows us to relax, setting up a hypnotic repeated texture against which the melody was projected. Here the choir did dance quite beautifully. As I have said the third movement, God's Grandeur, seemed determined to undermine the words with the brilliance of the setting. Though it pushed the singers to their limits at times, the result was a powerful tour de force. sung to such perky tunes and jaunty rhythms did rather jar and I was again curious about Britten's reasons for selecting the poems and his response to them. But I can hardly fault Londinium's performance and in their confident projection of the whole work they entirely made me forget my early gripes with the acoustic. 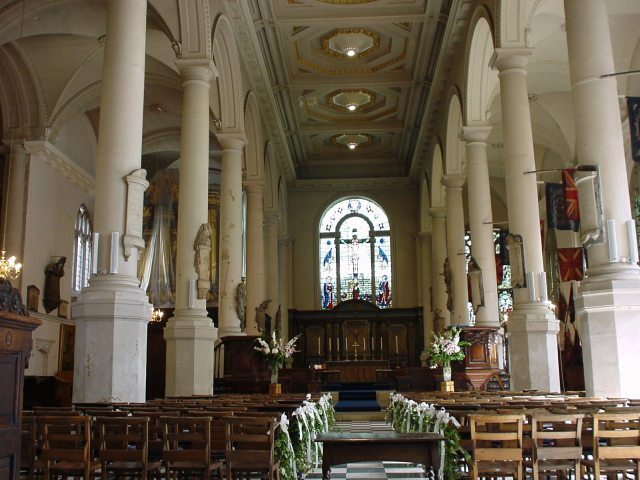 Londinium's next concert is on Friday 22 March in St Mary-at-Hill, Eastcheap, London EC3R 9EE when they will be performing Jonathan Harvey's Come, Holy Ghost and Angels alongside music by Tallis, Stravinsky, Philips, Rorem, Frank Ferko and Lassus. Further information from the Londinium website.